You talking graphics to me? If your GPU gears were revved by Nvidia's announcement last week of the GeForce GTX 780, hold onto your processors. There's another one on the way. The firm is lifting the lid on the GeForce GTX 770 today, a lesser-powered graphics processing unit that still packs a punch. Marketed as whisper quiet - like its older GTX 780 brother - the 770 comes with 1,536 CUDA cores and hits a base clock of 1,046MHz and boost clock of 1,085MHz. Memory-wise we're looking at 2GB and 4GB 256-bit GDDR5 (the former for 1080p play and the later Ultra HD resolutions), with a memory speed of 7.0Gbps, or, as Nvidia said, the fastest GDDR5 memory speed out there. Peak memory revs up to 224.3GB/sec, a hearty 15 percent lift over the memory bandwidth for the GeForce GTX 680. The suggested retail price for the 770 in 2GB form is $399 (around UK£263, AU$413), with pricing varied for add-in card partners for specific board designs, including 4GB, Nvidia noted. For that starting price, Nvidia promises a noticeable performance boost over lesser GTX -70 series cards. Though it leaves earlier processors in the dust, the GTX 770 is based on the same GK104 GPU found in the GTX 680. With a single precision of 3.2 Teraflops and other Nvidia goodies like Boost 2.0 tech and TXAA, the GTX 770 is a capable GPU workhorse. Compared to (Nvidia's) tests, it lands consistently above the HD 7970 GHz by AMD yet below the 2304 CUDA-cored GTX 780 during game play. 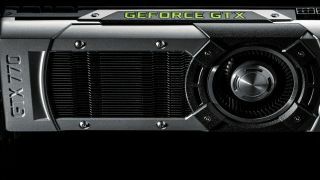 While it tests at about 4dB lower in noise generation than the GTX 570 and GTX 670, Nvidia advised that because the card will be available in both a reference design and custom boards designed and built by others, there will be a "wide range of board configurations and cooling options" for the GTX 770. The GTX 770 and its 3.54 billion transistors are on sale today.